Alina Adomaityte is Senior Business Development & Strategy Leader in Lithuania. Alina has a diverse experience from working in senior government roles. She is also the Founder and CEO of the Innoera Group, a leading Business Consulting Group in Lithuania. Innoera Group prides itself in structuring and attracting private investment with support from European Funding, World Bank and leading local commercial banks. 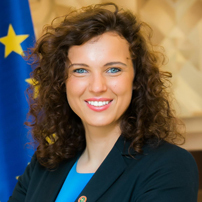 Alina, supports various government platforms: She is a Board member Board of the Lithuania Business Confederation (Agriculture); an Advisor to Parliament on promoting bilateral economic interest between Middle East and Lithuania; Member European Funding Committee (agriculture sector); Member Ministry of Agroculture for developing funding sources for European Union Grant. The team at Innoera has delivered to several international and domestic clients and created seamless working relationships with the government and investors. Innoera today has preferred partners in USA, UK, Middle East and India. Please visit www.investlt.com for further details. Alina, is a graduate from University of Management and Economics in Lithuania and a national level sportswoman.